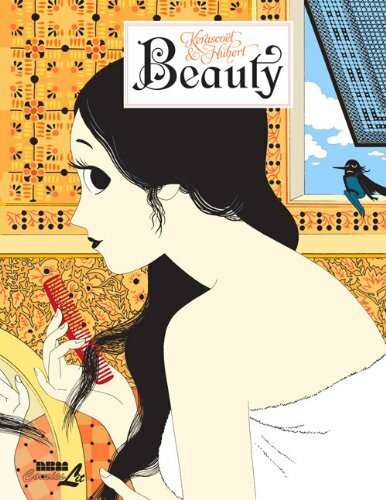 This graphic novel’s eponymous character is “Beauty”, an ugly looking girl whose only wish is to be beautiful. The story seems rather straightforward at the beginning. Coddie, the ugliest girl in the village saves a fairy, Mab, and in return, Mab grants her a wish — to be the most beautiful woman. Unfortunately, Mab cannot change Coddie’s appearance but what she can do is to change other people’s perception of her - which means Coddie will remain the ugly girl but when people chance upon her, what they see is the most beautiful woman they have ever laid eyes on. And from here, the story gets interesting, with kings vying for her and kingdoms lost, just to possess her great beauty. And what happens when she has a baby? Will she inherit her mother’s ugliness? “Beauty” is written and coloured by Hubert while the art is done by Kerascoet, whose previous graphic novel has been reviewed here. For “Beauty”, Kerascoet has used a very different art style, which is more understated. The art looks graphic and simple, but the composition and layout complements well with the story. What I find interesting is how Kerascoet still illustrates Coddie as an ugly girl at times, because as what Mab the fairy says, Coddie still looks ugly and she can’t change that nature, but rather the perception of others. Some readers may find this confusing though. “Beauty” is rather long and took quite a while to finish but the reader will find it rewarding. Hubert explores the underlying tone of desire well with his writing and how beauty can be a curse sometimes. Hubert and Kerascoet previously collaborated on another graphic novel — Miss Don’t Touch Me with Kerascoet, which is reviewed here. The book is in hardcover and beautifully printed and I would highly recommend it.